If you have an old roof, it will need replacing at some point. Choosing a roof, however, can be quite difficult. While all roofs have their own pros and cons, they are not all suitable for every building. This is why your Chicago roofing company will usually give you a list of options, but you are the one who will ultimately have to decide on which option to go for. So how do you choose? Some of the questions you need to ask yourself – and your contractor – to come to that decision are listed below. What is the goal of the building? You may intend to sell the property very quickly, or not. You may change its use soon, or expand the property. Who uses it and how is also important, as is who will be responsible for roof maintenance. Consider the climate, how often the building will be used, and how you can minimize your energy expenses, not in the least because this saves both money and the environment. What elements are of influence? These are things such as the direction of the building, the topography, the weather trends, building codes, the age, height, design, shape, and size of the building, the construction materials, the fire protection and HVAC equipment, and so on. What roofing options exist in terms of membrane? There are, according to the SPRI, three types of membranes available: the modified bitumens, the thermoplastics, and the thermosets. Each of these have their own particular pros and cons that you must familiarize yourself in order to find the best one. How will the membrane be attached to the building? Usually, the are a number of different options available. Simply basing your decision on costs, however, is not a good idea. You need to make sure that the system can hold the weight of the roof, and that it is resistant enough to the environmental elements. Are the roofing materials UL certified? If not, you have to go to a different roofing company. If a roofing system is UL, it proves that it is made properly and insulates up to certain specific standards. Do you need a wind uplift rating? 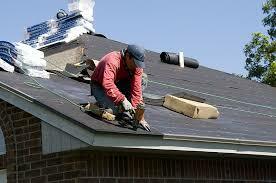 A good roofing contractor will test this and determine whether or not it is needed. Certain standards have been set for this, which you can check up on. How heavy will your building be once the roof is installed? This is something very few people think about, but is actually incredibly important! After all, you must make sure that your foundations and load bearing walls are strong enough. Does the system give you good value for money? Only you can determine this, but it should be based on all the factors above. What type of warranty do you get and who provides this? You should look for an extensive, professional warranty. What type of after service will you receive? This includes maintenance and repairs.